Overall. 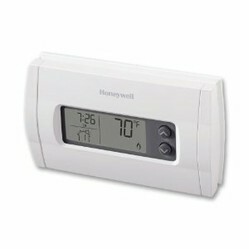 the Honeywell RTH230B programmable thermostat is certainly the best if you're looking for high quality and small size for a cheap rate. There's one aspect that certainly needs to be stressed on - Overriding the system! No matter how much we think it through, it's not necessary that we're going to stick to the same plan 48 hours later - right? That's the reason this programmable thermostat has the capability to be re-programmed just for a particular instance of time; that is, if you re-program it for an hour or so, the instructions that you already fed in for the next day won't be erased. But, every amazing device does have a draw back and this thermostat has a single problem which you should certainly know about - When you toggle the temperature up/down buttons, the display doesn't light up; and hence, you're going to need to switch on the lights in the room. Other than that, there's nothing to worry about. Easy to install - You may be doing this for the first time ever, but you need not worry as the installation manual is detailed and you would be able to do it with ease. Moreover, I've written an installation guide at the end of this article just in-case you needed help. Appearances are praise worthy - No one would want an ugly looking thermostat in their houses - especially the living room. Therefore, Honeywell has taken the trouble to ensure that this piece blends well with any interior decor. It's got a neat clip on cover which hides all the programmable buttons other than the ones used to increase/decrease the temperature in the room. Soft buttons - The buttons to control the time as well as temperature are really soft and comfortable to use. Time display - The time could be displayed either using the 12 hour clock or the 24 hour clock, it depends on what you're comfortable with. Programming and working - The thermostat is really good at it's job and the temperature is always accurate at the preset level. Moreover, weekends are totally unlike the weekdays and hence the temperature controls would need to differ; hence, there's an option to program separately for weekends too! Heating and Cooling - This thermostat is perfect for homes where both heating and cooling are needed as it's an auto switch over. All you need to do is set the temperature. Battery Consumption: Is it a problem? - Many people complain about the battery consumption and they say that it goes through them like water. But, there's absolutely no problem with the design and functioning of the Honeywell RTH230B programmable thermostat; the problem lies in your wiring. Hence, you need to make sure you do it right when you install it. Call a neighbor for help if you need someone. Instructions on connecting the wires are given below. Nothings perfect and this piece has a negative aspect as well! No Display light - As already mentioned in the beginning of the article, this thermostat is really bad if you choose to operate it in a dark room. When you try to alter the temperature you will not be able to see what you did - unless you have a light on in the room. Would you consider the Honeywell RTH230B for your home? Why do you make that decision? Some other 750 millivolt systems. Before checking this out, you would be happy to know that the installation manual explains all this as well. Your Safety - For safety purposes, the first thing that you need to do is cut off power to the thermostat (In case you had an older one installed). Once you've removed the old thermostat, you would need to mark each wire as this would help prevent any sort of confusion - this is only needed if you use both heating and cooling - else, there won't be many wires. If at all there's not a lot of wire at the end, you could strip a bit of the insulation so as to retrieve a decent amount of wire. Now you need to make sure that they don't slip into the wall socket, how you do this is up to you - try tying them around a knitting needle maybe? Take off the face plate and loosen all the screw connecting the thermostat and face plate. The screw shouldn't be removed completely - it doesn't; but, you shouldn't try to. Now you would need to figure out the spots for mounting the thermostat - the mounting holes. You could do this by holding the thermostat against the wall and mark the spots. Once you've made the required holes (drilled through) you could then pass the wires through into the base plate. Now that that's done, screw the base plate and fix it onto the wall. The tricky part - Connecting the Wires right! First and foremost you would need to remove the red cable for two and five wire installations; if you're opting for three and four wire installations, you would need to leave it as it is. Three Wire Heating - Rh and W terminals need to be attached with the Red Jumper cable so that it connects the wire to the W terminal and this to the G terminal. Three Wire Cooling - Rc and Y terminals need to be attached with the Red Jumper Cable so that it connects the wire to the Y terminal and this to the G terminal. Four Wire Heating and Cooling - The Rh and W terminals need to be connected with Jumpers to the Y and G terminals. The heat and cool relays need to be connected to all the corresponding terminals with the jumper cable (The Fan relay) connected to the G terminal off the Cool relay. 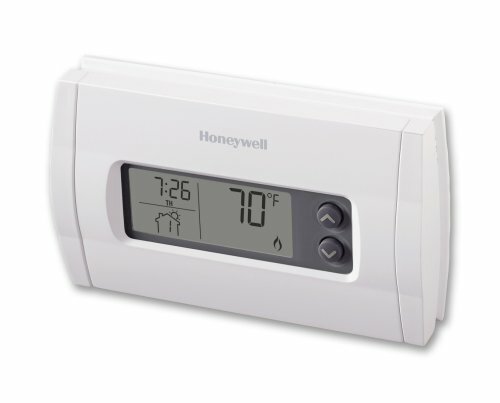 This Honeywell thermostat table would help you pick the best model for your home within minutes as the features are listed besides the model number.